Built by Sunseeker International to RINA class and MCA compliant with delivery in 2014, she features a classic, contemporary interior in Black American Walnut. Accommodation is for 10 guests in five staterooms comprising of a full beam master suite on the main deck with four guest staterooms below and spacious accommodation for the yacht's five crew. She comes complete with the yard’s Platinum Upgrade Package, including stabilisers, long range fuel tanks and tropical air conditioning. Guests relaxing al fresco on the expansive flybridge can be shaded from the heat of the sun by an electrically operated hydraulic sun awning, while power comes from twin MTU 2000 M94 engines. 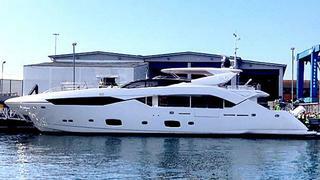 NO.9 has been delivered to her owner in the South of France, where she will remain berthed through 2014.